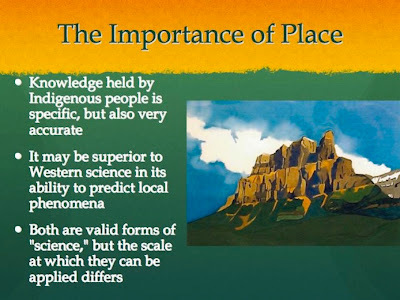 Slide 1: Title This lesson or module addresses the issue of knowledge that is acquired by examining the natural world and shows that the Traditional Ecological Knowledge of Indigenous peoples is powerful and exists as a way of knowing that can be linked to Western scientific studies of nature. Neither system is privileged or exclusive, in some cases these two traditions reveal insights that are very similar but in other areas they can lead to very different insights. Slide 2: Raven is especially important to peoples of the Pacific Northwest and the Arctic. In these parts of North America Raven is regraded as both a creator and a trickster, which speaks to the complex behavior of ravens, which are probably the most intelligent species of bird on the planet. 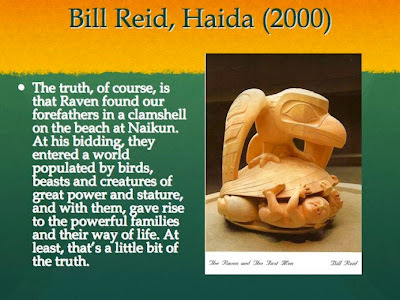 In this story of creation told by the great Haida artist Bill Reid, Raven assumes its role as creator, finding humans by breaking open a clam that it finds on the beach, and inside the clam there are strange little creatures that become the first Haida people. 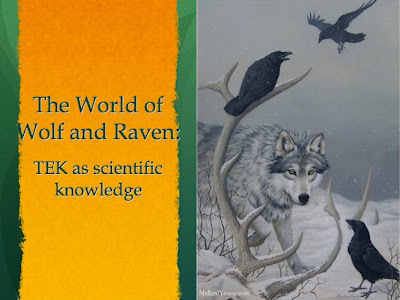 Slide 3: Ravens and wolves are often found together in nature because Ravens may guide wolves to prey or to carcasses and the presence of wolves at a carcass lets ravens know that it is safe to come and feed. 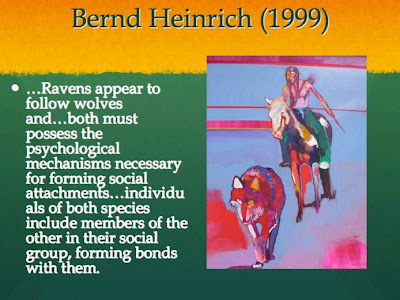 The quote in the slide is from the famous ecologist and student of animal behavior Bernd Heinrich, who studies ravens. Heinrich found that, given a choice, ravens prefer to join wolves at food, rather than feed on a carcass when there are no wolves around. The Encyclopedia Brittanica defines the enlightenment as "an European intellectual movement of the 17th and 18th centuries in which ideas concerning God, reason, nature, and man were synthesized into a worldview that gained wide assent and that instigated revolutionary developments in art, philosophy, and politics. Central to Enlightenment thought were the use and the celebration of reason, the power by which man understands the universe and improves his own condition. The goals of rational man were considered to be knowledge, freedom, and happiness." The goals of the Enlightenment were to free humans from the narrowness of religious thought and celebrate humans. In reality it functioned to remove humans from nature and to set the scene for the Industrial Revolution and Capitalism. Slide 5: We can seek the origins of the scientific revolution in the European re-discovery of Aristotle in the twelfth and thirteenth centuries. Aristotle entered the European Middle Ages by means of the Islamic world, which had preserved both Aristotelian and Platonic philosophy after Europe had completely forgotten it. 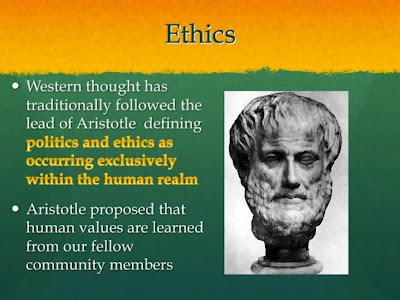 Originally, Aristotle based knowledge on a kind of empiricism: he would investigate a question by a) examining what everyone else had said about the matter, b) making several observations, and finally, c) deriving either general or probable principles on the matter from both a and b. This method of thinking, which is the theoretical origin of empirical thought, formed the rudiments of a new revolution in human thinking in the twelfth and thirteenth centuries. The earliest Aristotelians were burned as heretics (in a medieval university, when they fired you, they really fired you; have you ever wondered where the expression might come from?). Francis Bacon: The grounds for a mechanical universe, that is, a universe that operated like a machine, was laid down by Galileo's insistence that the universe operated by predictable mathematical laws and models. In addition, Francis Bacon (1561-1626), added a key element to the genesis of the mechanical universe in his attacks on traditional knowledge. 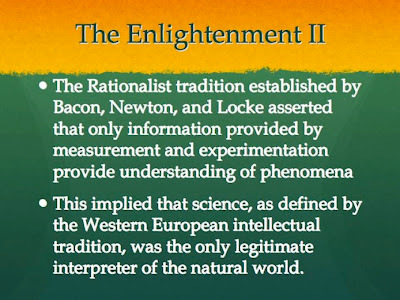 Bacon wasn't a scientist in our sense of the word, but he did take great joy in telling everybody why they were wrong. In particular, he argued that all the old systems of understanding should be abandoned: he called them idols. He believed that knowledge shouldn't be derived from books, but from experience itself. Europeans should move beyond their classics and observe all natural and human phenomena afresh. 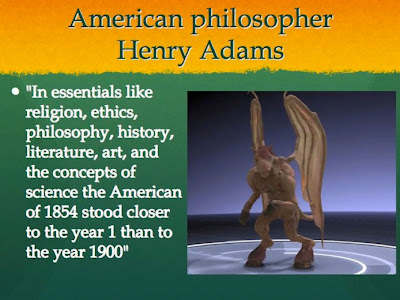 Slide 6: The eighteenth century was a century of mind-boggling change; when Europeans entered the nineteenth century, they lived in a world that barely resembled the beginning of the eighteenth century. In the one hundred years in between, European thought became overwhelmingly mechanistic as the natural philosophy of Isaac Newton was applied to individual, social, political, and economic life. 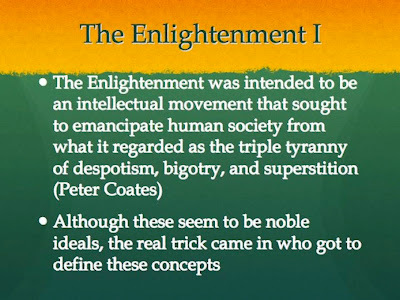 The century saw the development of the philosophe movement,which articulated the full values of the European Enlightenment, including deism, religious tolerance, and political and economic theories that would dramatically change the face of European society. Europe itself changed from a household economy to an industrial economy. This change, perhaps one of the most earth-shattering transitions in human history, permanently altered the face of European society and the family. Finally, the century ended in revolution. The ideas of the philosophes were translated into new governments--one in France and one in America--that shook the old order down to its very roots. Europeans were emerging from a time of ignorance and assumed that Indigenous peoples they encountered were automatically ignorant. They associated the place-based, relationship driven worldview of Native peoples as ignorance and superstition. 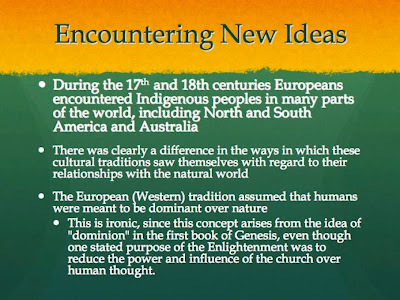 Slide 7: One of the major differences between these worldviews is that Indigenous peoples did not develop the idea that they should be dominant over the natural world. Instead they had come to an accommodation with nature that allowed them to live well without trying to change or dominate the nonhuman world. [The hunter gatherer child] learns that many animals have to be given water when they are killed to ensure that some of their number will be willing to die again when she and her family need food. She discovers that animals and humans must be at peace with one another. [Her language] has no words for ‘vermin’ or ‘weed’. There is no demarcation between the life of an animal and that of a human - no word for ‘it’… Bit by bit she will come to understand that the world around her is shared both among people themselves and between people and the other creatures that belong here. Human consciousness is therefore essentially a social intelligence, designed by natural selection for dealing with people, but also highly applicable to understanding, predicting and controlling a wide range of phenomena. Unless suppressed during upbringing, this way of looking at the world is spontaneously generalised beyond the social sphere, so the significant world is seen as composed of 'agents', having dispositions, motivations and intentions. Humans see the world through social spectacles. 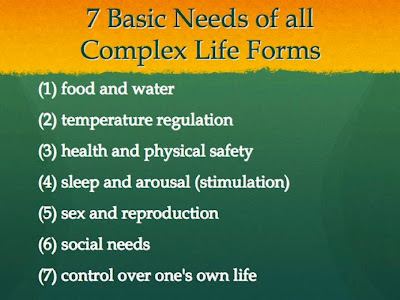 Slide 8: These 7 Basic Needs were defined by the cultural anthropologist Eugene Anderson in his 1996 book, Ecologies of the Heart (Oxford University Press), which deals with how humans can live with nature by caring for it. It is easy to see from looking over this list that nonhumans and humans are much more similar in the needs in their lives than is often recognized in the contemporary world. Today humans are often ready to sacrifice #7, Control over their own lives, for #3 health and physical safety. This can be seen in what happened in the US after 9/11 when the President made a serious effort to take away control from people in exchange for the illusion of safety. In fact people are much more likely to die in a car accident or to be shot or stabbed by a family member than they are to become victims of terrorists. 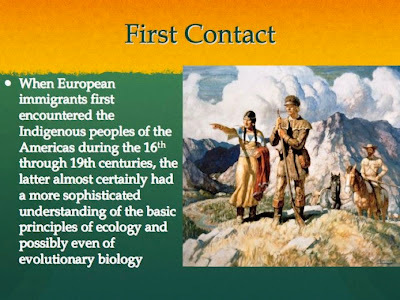 Slide 9: Fear and Ignorance dominated much of Euro-American attitudes towards the nature of North America as they invaded in the 17th and 18th centuries and expanded their invasion during the 19th century. The Animistic worldview of Native Americans provided a much more nuanced and sophisticated view of nature than the Enlightenment and its concepts of dominance over combined with fear of, nature. 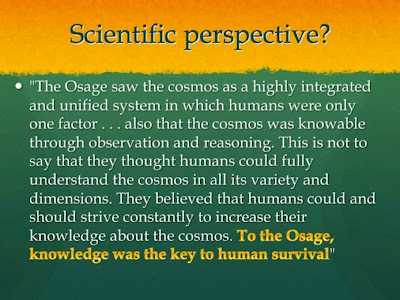 This means that in terms of concepts understood by the contemporary scientific community that Native peoples had a much better understanding of natural phenomena and how they functioned. The image shows the Shoshone Sacajawea guiding the "Journey of Discovery" led by Lewis and Clark through the Rocky Mountains or Tosa Toya (The Shining or White Mountains) as they were called by the Shoshone people who had lived there for millennia. The quote is from Chapter 1 of Pierotti (2010) Indigenous Knowledge, Ecology, and Evolutionary Biology (Routledge Press). 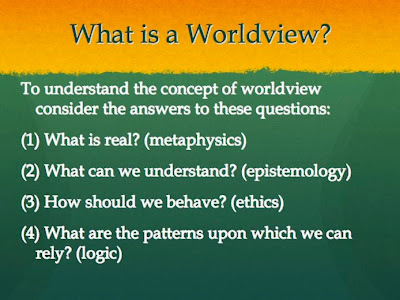 Slide 11: Worldviews of different individuals or cultures are tied to philosophy. This means that looking at the different components of philosophy can help you to understand your own world view or that of the cultural tradition from which you come. Ethics refer to how an individual behaves or chooses to behave. In the Western tradition ethics exist only in the realm of human interactions. In Indigenous thinking ethics involves interaction with all of the world. Logic is the study of reasoning and is used in most intellectual activities. It is studied primarily in philosophy, mathematics, and science. Logic examines general forms which arguments may take, which forms are valid, and which are fallacies. It is one kind of critical thinking. Logic is an entire subdiscipline within philosophy linked strongly to epistemology, which asks: "How do we know what we know?". If you wish to explore this topic click here for an online textbook. 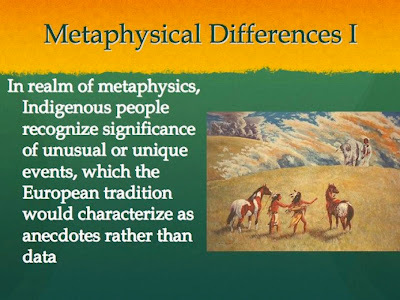 Slide 12: Indigenous peoples employ a different metaphysics than do Europeans. One feature of Indigenous metaphysics is taking seriously any event or testimony about an event. In this image we see the story of White Buffalo Calf Woman who is a very important figure to tribes of the American prairies and Great Plains because it is said that she brought the Buffalo to the people. Bison were so important in the lives of tribes who lived on the plains that their links with humans required powerful stories that explained why this species had to be treated with utmost respect and care. Slide 13: Western Science relies heavily on data, which are typically multiple observations of the same phenomena that are recorded and analyzed. In this approach, single observations of unique phenomena are not given as much weight because they are not generalizable. 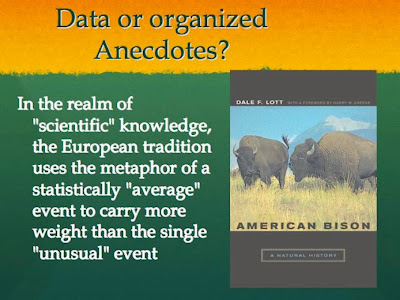 The book shown, American Bison: a Natural History, by Dale Lott, a Professor at the University of California at Davis, describes a good deal of information about Bison, but it does not deal with their metaphysical importance of Bison to Indigenous people who based a way of life around this species. Indigenous people and their traditions also rely for the most part on repeated observations, but these are not usually quantified in the same way as Western data. Both approaches have their strengths and weaknesses. The Western approach is good for looking at physical objects, but it is weaker on relationships and the importance of individual organisms. In contrast, Indigenous knowledge is strong on relationships and the role of individuals, but does not look at the structure of matter, as in chemistry and physics. 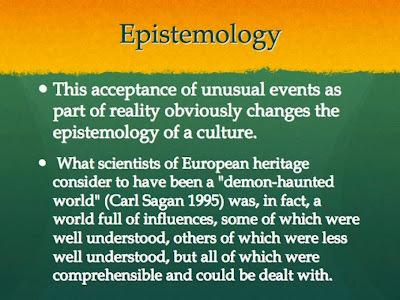 The emphasis on metaphysics in Indigenous knowledge, led western thinkers and scientists like Carl Sagan to view their world view as "demon-haunted", which implies that they were fearful because of their emphasis on spiritual aspects. This is odd, be cause as in the case of the Jersey DEvil (above) it was Europeans who were fearful of the natural world, whereas the Indigenous people knew how to function without being paralyzed by fear. A good discussion could be had concerning how knowledge is constructed and conceived of in different cultural traditions. Sagan himself died alone and frightened because he had no spiritual principles and he was convinced that with his death he and everything he stood for would disappear. Students might compare Sagan's experience with their own attitudes. Slide 16: In its alleged impersonal “objectivity,” Western science typically fails to consider the responsibility scientists owe towards study organisms. There is also little, if any discussion, of the obvious reciprocal relationship between investigator and subject. As described by a major philosopher from the Western scientific tradition: “Whatever the scientists’ feelings, or style, while working, these are purged from the final work” (Wolpert 1992, 57). In contrast, in Indigenous traditions such reciprocal relationships are central to understanding the basis by which knowledge has been acquired through careful and detailed observation. For example, in hunting relationships it is essential that the hunters regard themselves as the equal of, rather than superior to, the prey organism (J. Marshall 1995; Anderson 1996). Slide 17: Western Science is set up so that its discoveries are presumed to be "true" wherever similar sets of conditions occur. Thus the results of a study of wetland ecology is assumed to be applicable to all wetlands anywhere. Similarly a systematic study of the behavior of gull behavior is assumed to apply to all gulls anywhere. This is true in a limited sense. For one thing conditions are never exactly the same and the differences may have profound impacts on what actually occurs. As an example, I have studied the behavior and ecology of various species of gulls of the genus Larus all around North America. The basic behavioral repertoire of gulls has not varied a great deal, in that their calls and nesting activities are similar and the number off eggs they lay is the same, which supports the Western approach. What is equally important, however is that the ecological conditions have never been the same in any two colonies, and this has caused major differences in how the birds use their behavior. Diet choices have differed, both among colonies and individuals, habitat choices have varied, and even the nature of their social behavior and mating systems have varied. This variation is not part of the Western tradition, although the Western tradition is now making efforts to incorporate variation into its theories and concepts. Understanding local conditions and how they may vary from conditions in other areas lies at the root of Indigenous knowledge. 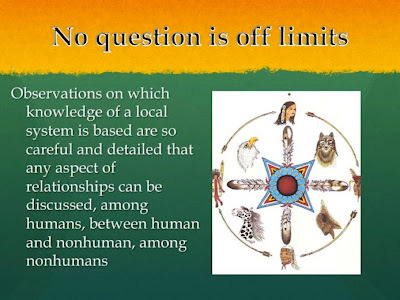 Slide 18: In Indigenous traditions all questions are valid, and knowledge about nature and other species is constructed within a tradition that incorporates ethical and metaphysical considerations. This is different from Western approaches where some questions are considered to lie outside of science, especially issues concerned with ethics and metaphysics. One result is that Indigenous people interact with other species while assuming a reciprocal relationship that incorporates ethical responsibilities that apply to all living creatures, and even to the land itself. 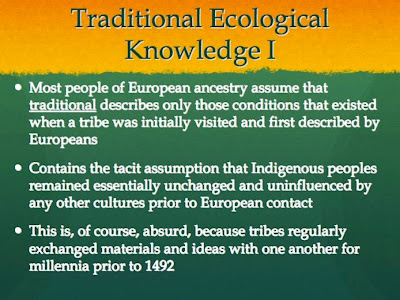 Slide 19: Use of the term “ecological” to describe Indigenous knowledge is important, because it establishes the links of these flexible and adaptable traditions to the natural world. At the same time, TEK is not so inclusive that it appears to incorporate all of the knowledge held by Indigenous peoples. 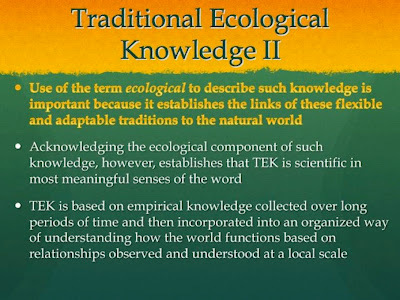 Acknowledging the ecological component of such knowledge, however, establishes that TEK is scientific in most meaningful senses of the word. 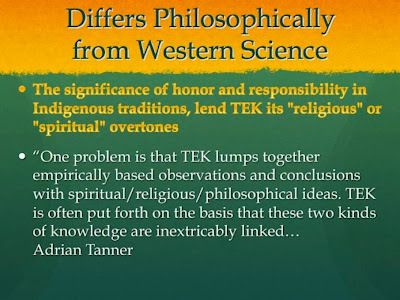 That is, TEK is based on empirical knowledge that has been collected over long periods of time, and then incorporated into an organized way of understanding how the world functions based on relationships observed and understood at a local scale. Slide 20: One reason that Western Science and Western culture as a whole tends to devalue Indigenous knowledge is that they believe that knowledge must be recorded, i.e. written down in a way that can be read and evaluated. As a result they tend to downplay knowledge contained in an oral tradition and treat the stories that comprise such systems as "Fairy tales" or "legends". This approach ignores that fact that oral traditions are very effective as teaching tools, because they are an effective way of communicating concepts and fundamental premises, in addition to providing information about how the natural world functions and how human beings are part of that world. 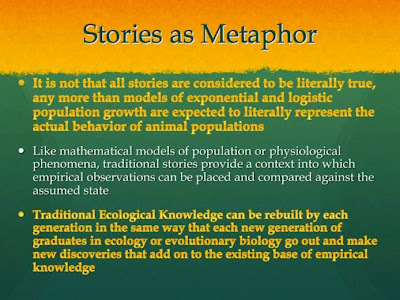 Slide 21: What is important to keep in mind is that many of these stories function as metaphors that provide both insight into the dynamics of nature combined with instructions for humans on how to live properly. Western science also depends heavily on metaphor, for example the tendency to refer to a "genetic code", or to the heart as a "pump", or to mitochondria as the "powerhouse of cells". It is virtually impossible to teach or even talk about the natural world without employing metaphors from human cultures. Western science often relies upon mathematical equations that function in a metaphoric sense to provide simple ways of thinking about the world that allow learners to incorporate their own observations and insights within the simple framework. 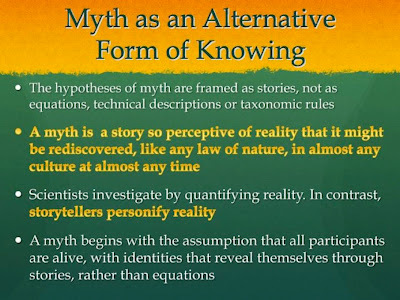 Slide 22: Myth is story about the origins of natural phenomena or aspects of human behavior. They are neither true nor untrue, but they resonate within cultural traditions. There is a tendency in modern society to equate myth with superstition or ignorance, even though all cultures, including Western cultures are permeated with myth. Science is not immune to myth, for example the story of Issac Newton discovering gravity when an apple fell upon his head, or of Archimedes in his bathtub discovering laws of physics. A key point is that scientists try to avoid incorporating myth, which in essence means that they try to ignore the myth that permeates their own disciplines. One of the dominant myths of Western Culture is that Columbus "discovered" America when in fact the first humans encountered America many thousands of years earlier. This myth allowed Europeans to treat America as if it were an empty land that they could mold according to their wishes and inclinations. Slide 23: Many people, including scholars, of European heritage argue that traditional practices can only employ primitive technologies, such as bows and arrows, presumably using stone arrowheads, or canoes, presumably dugout or manufactured from birchbark. Following such logic to an absurd extreme, it might be questioned whether the buffalo cultures of the plains peoples of North America, including the Cheyenne, Lakota, and Comanche people, can be considered as traditional. Hunting from horseback was a major part of this tradition, yet it is well established that Europeans introduced domestic horses into North America in the 16th century. A good discussion can be held concerning the use to the term "traditional" and what it means in the lives of various students. 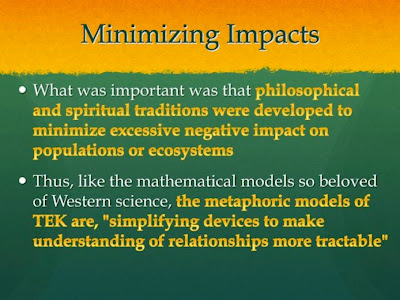 Slide 24: It is important to keep in mind that of all of the aspects of Western Science, the study of ecology is closest to the type of knowledge gathered and held by Indigenous peoples. The length of time over which TEK has been collected is unimaginable to western science, however, where a study of ten years is considered long-term and a study lasting 100 years has never been done. This is because in many cases studies are constrained by time, such as the length of time in grad school (5-7 years) or even during an academic career (40-50 years at most). 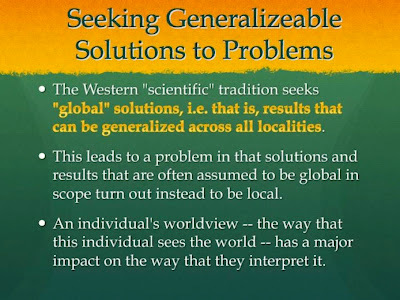 This statement reveals a great deal about the assumptions made by adherents of “Western science.” To begin with if spiritual equals philosophical, then the Western scientific tradition is full of such ideas and language. 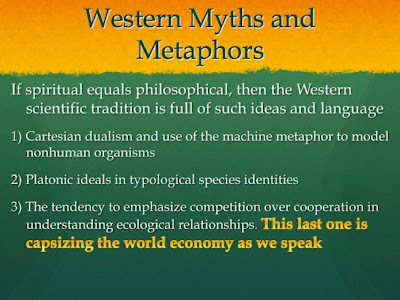 Slide 26: Examples of Western myth base metaphors are Cartesian dualism and use of the machine metaphor to model nonhuman organisms, Platonic ideals in typological species identities, and the tendency to emphasize competition over cooperation in understanding ecological relationships. The Western scientific tradition depends heavily on models and metaphors that have philosophical ideas at their roots. 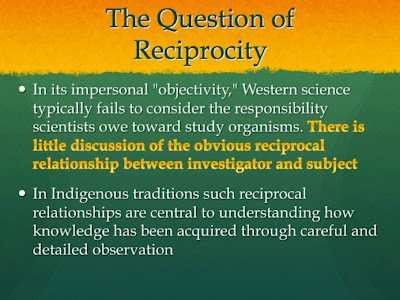 Slide 27: As we discussed above, reciprocity is a principle concept in Indigenous thinking about nature and relationship to other life forms. The Western tradition struggles with the concept of reciprocity because this idea is thought to conflict with the idea derived from Darwinian Natural Selection that life in nature is a struggle. Of course this idea is not really in Darwin, but is another Western Myth that has been extrapolated from Darwin’s ideas. 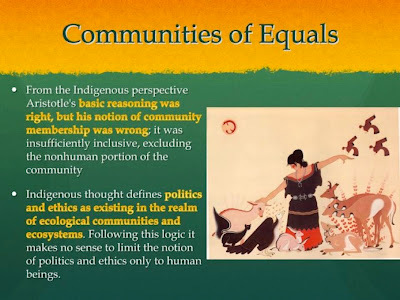 To Indigenous people reciprocity is a central concept, whereas to Western thought it is a controversial topic that is set up against the ideas of competition and selfish behavior. Western science places unreasonable conditions on any behavior that could be defined as reciprocal, because it has difficulty accepting that nonhumans have the mental capacity to create a network of reciprocity, whereas to Indigenous people this is a character shared by all life forms. Slide 28: An important issue that can lead to discussion is "what is religion" and how does it affect the way we think about the world. In the indigenous tradition there is much more spiritual engagement with the natural world and less need for churches or temples, i.e. buildings that are designated as sacred. Instead all of the world is sacred and spiritual experiences can take place in any location. 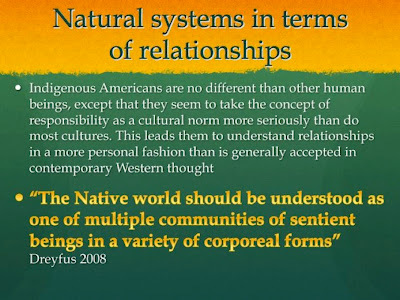 Slide 29: The emphasis on relationships is important because Indigenous people traditionally depended upon nature to provide for them in terms of food, clothing and shelter. As a consequence they worked to make sure that other species did not become angry with them for wasteful practices or behaving in a disrespectful manner towards other beings. This attitude was taught to all members of a culture as a way of preserving a way of life and trying to make sure that the culture could persist. Slide 30: These premises are important because even though they can be interpreted as spiritual or ethical, they are also core concepts to scientific knowledge. 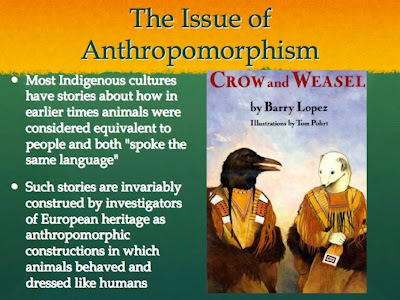 Slide 31: The issue of anthropomorphism is considered to be important in western science, i.e. that humans should not attribute human features and actions to nonhumans. In recent years some Western scientists, such as Franz deWaal, Jane Goodall and Mark Bekoff have argued that such attitudes have limited our ability to understand nonhumans. 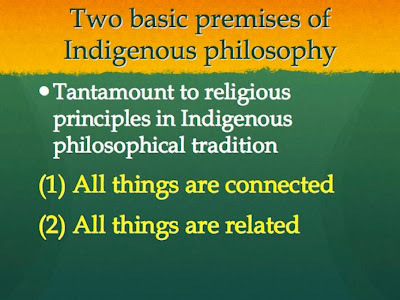 These arguments are quite similar to concepts developed and emphasized through indigenous cultural traditions. 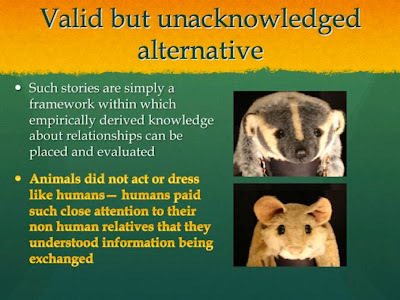 Slide 32: In ancient times humans probably had much closer relationships with nonhuman animals and were thus much more aware of similarities between human and nonhuman. As a consequence humans understood the ways in which animals communicated with one another both within and among species, including humans. This is another way of addressing relationships with nonhumans. They are seen as equivalents of humans and their social relationships are taken seriously to function as metaphoric variants on human social obligations. In contrast, their weaknesses can also be used to show humans how not to act. 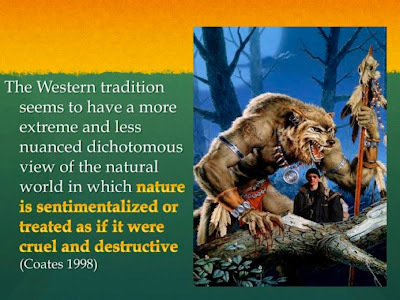 Slide 33: The western traditions tends to either demonize or sentimentalize nonhumans, especially predators, which are perceived of being "enemies of Humans". This topic is delat with in considerable detail in our module on Predators and Prey (link). This image shows a very strange conflation of images, linking Indigenous people and wolves in the guise of a werewolf or wolfman-like figure who seems to be capable of making trees bleed. This also illustrates the tendency in some western thought to portray Indigenous people as savages or beasts. 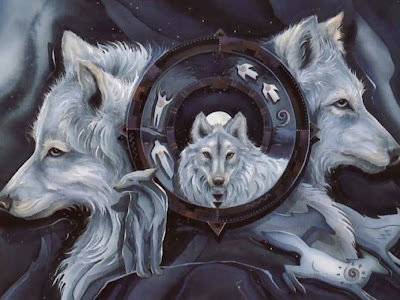 Slide 34: In contrast to the wolf as beast, we have this western image which sentimentalizes wolves, while alos using Native American imagery. This conflicted attitude towards wolves is also reflected in the confused and conflicting views of Indigenous peoples held by many people of European ancestry. The important thing is that both of these images do not represent the reality of wolves. The same is true of treatment of indigenous people who are often either demonized or romanticized in the way they are perceived by EuroAmericans. 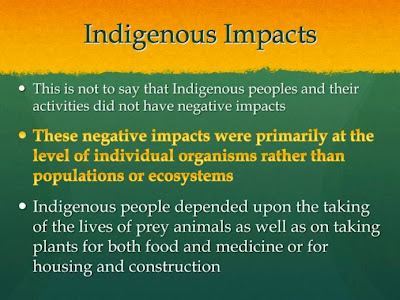 Slide 35: All living beings have some sort of an impact on their environment, but the romantic sentimentalized view of Native peoples tries to pretend that these people did not impact their environment. This is a mistake and also leads to foolish conflicts where some conservationists want to believing that Indigenous people had attitudes just like their own. This is wrong because Native people do not sentimentalize other life forms, but respect them and their abilities and work to maintain a reciprocal relationship with these other species. Slide 36: The reason that Indigenous people do not sentimentalize their relationship with nature is because they depend upon it for survival. This means that their goal is to reduce problematic interactions with nature and to minimize negative impacts. This was the basis of the ideas of respect, reciprocity, and connection, i.e. to insure that important species did disappear or avoid humans. Thus, the stories that established this tradition can be thought of as management schemes that emerge from connection and relatedness, rather than maximizing income from hunting or fishing. 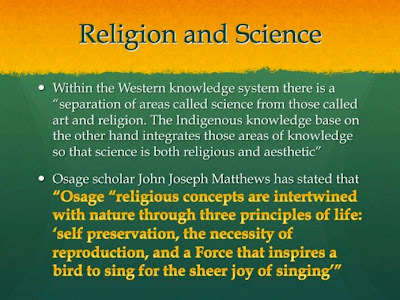 Slide 37: This quote from Osage Tradition expresses the ideas we have been discussing. Humans needed to understand nature because the better thy understood it the better their chances of survival, both as individuals and as a culture.